You can see what I made of them all after the gallery, starting with the Eco To Go Cup. I got my Eco To Go Cup earlier this year. It’s a lightweight, 9oz cup (there’s also a 12oz version) made from 80% rice husk, a waste product from rice production, to which plant resin (the remaining 20%) is added to produce a plastic-like substance. Given my dislike of plastic reusable cups, I was a little fearful, but I needn’t have worried. I really enjoyed drinking out of it (which isn’t always the case for plastic cups) and there was never a point when the taste was affected by the cup. In look and feel, it’s very similar to the Ecoffee Cup, light and very durable. It’s also fully biodegradable, so if you do decide to throw it away, it doesn’t have to go into landfill (although why you would want to throw it away is beyond me!). I took it on several road trips earlier this year, including an initial outing to the Glasgow Coffee Festival, as well as a day out to Lord’s. I was sufficiently impressed that when it came to my trip to Tokyo in July, it found its way into my rucksack, featuring heavily when I tried all six-single-origins at About Life Coffee Brewers. It’s now in my regular rotation for when I want a light, robust reusable cup. The verdict: if you want something light, compact, practically indestructible and with impeccable environmental credentials, then you really can’t go wrong with the Eco to Go Cup. Next up, my Global WAKECup, which you can read about after the gallery. Global WAKEcup is a UK brand which includes much more than cups, stretching from backpacks to wooden straws. When it comes to cups, there are a range of options, but the one that is of interest to me is the 9oz Travel Mug. 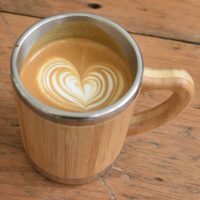 This is a double-walled stainless steel mug, with a bamboo outer sleeve and, unusually in the reusable cup market, a handle (also covered in bamboo). The first thing I will say in its favour is that it’s eye-catching. The WAKEcup regularly gets the most “oh wow!” comments from baristas. It’s also quite novel having a handle, although the wall of the mug is also cool to the touch, the mug doing an excellent job of keeping the contents warm. Being stainless steel, the mug doesn’t affect the taste and I really enjoy drinking out of it. The major downside is the size. Although not much bigger than my other 9oz reusable cups, the additional of the handle makes it much bulkier. That said, it still slips easily enough into my rucksack. I got my WAKEcup not long after my Eco To Go Cup and, after quick road tests at the World of Coffee in Amsterdam and on a day trip to London, it was added to my kit for my trip to Tokyo in July, where it was met with many appreciative comments. The verdict: easily the best-looking reusable cup I have. The double-walled stainless steel is excellent at keeping your drink warm and your hands cool. If you’re looking for a reusable cup with a handle, then this really can’t be beaten. My final new cup this year is the intriguing HuskeeCup, which you can read about after the gallery. Like many of the world’s reusable cups, HuskeeCup is Australian, distributed in the UK by Eco To Go. Like the Kaffeeform cup, it’s made from a coffee by-product, in this case, coffee husk, which is produced when the coffee is milled. This is then combined with polypropylene to produce the HuskeecCup, which comes in 6oz, 8oz and 12oz sizes. It’s designed as much for coffee shop use as it is a reusable takeaway cup, coming with either a saucer (shop use) or a lid (takeway). With the exception of the double-walled cups, such as the WAKEcup and Therma Cup, one of the biggest problems with reusable cups is that they very quickly get hot to the touch. This is usually solved by the addition of a sleeve, often of food grade silicone, but the HuskeeCup gets around this by adopting an innovative ribbed design, with vertical fins running from the base to almost the lip of the cup. This not only gives the cup a striking, stylish look, but keeps it cool to the touch. I got my HuskeeCup at the start of November, so haven’t had it for very long. I took it to the Manchester Coffee Festival for a road test and quickly fell in love with it. I have the 6oz version and find that it’s the perfect size for flat whites. It’s also ideal for drinking filter coffee from at home and I can see me using it as much there as on the go. I love the way it looks, love the feel of it in my hand and, along with my Therma Cup, it’s my favourite cup to drink out of. The verdict: if you’re looking for a genuine 6oz reusable cup, other than the plastic KeepCups, this really is the only game in town. Add to that a stylish design and its small size and you’re onto a winner. To help promote cup reuse, I’ve teamed up with Global WAKEcup, which is offering a WAKEcup travel mug as a prize. To win, all you have to do is post a link to this article on Twitter with the hashtag #WAKEcupWIN and tag up to three friends who you think would benefit from having a reusable cup. You’ll get one entry per friend tagged (up to a maximum of three). The competition ends on 30 November 2018 and the winner will be selected at random shortly after that.